As air flows through the filter, dirt gets caught in the crevices of the filter material. Eventually, this causes the filter to lose effectiveness and reduces the efficiency of our furnace or air-conditioner. The Furnace Filter Whistle will alert you when the filter is near capacity indicating time to replace the filter. The BITS Eco-Logical Furnace Filter Whistle has two parts. The HAT (a flat disc) and the BASE ( a cylinder with a flange). 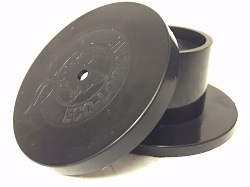 The Logical Furnace Filter Whistle is reusable. Simply wash in warm water and re-install in the new filter.